If there’s a rebellion Nicie and I will find it. We keep tripping over battlefields. In NJ-11 we walked Jockey Hollow. That was where Washington encamped the Continental Army through one of America’s most brutal winters before defeating the British at Yorktown. In W. Virginia, we learned about the Battle of Blair Mountain, when 10,000 armed coal miners faced 3,000 strikebreakers. That was the most important battle of the Labor Wars. Here in Pennsylvania’s 18th, we discovered the Whiskey Rebellion. American whiskey was born in southwest Pennsylvania. There were 4,000 stills here in 1791. But, in 1791, our brand new country was almost bankrupt. It had that Revolutionary War to pay for. Alexander Hamilton, the new Secretary of Treasury, proposed to Congress the first-ever tax on a domestic product - whiskey. The new Congress voted, and passed the tax. The people who owned those four thousand stills here in Southwest Pennsylvania were not happy. Many of them had fought in the Revolutionary War. “Taxation without representation” was still prominent in their minds. Also, apropos of today’s climate, people on this western end of Pennsylvania saw the tax as a Federalist - and coastal elite - effort to take advantage of the rural community. This community grew corn and rye. The best way for them to profit from their efforts was to transform it into spirits. Whiskey kept and transported to the eastern city markets far more efficiently than perishable grains. All this history made Nicie and I decide we needed to visit a distillery, so we stopped by Wigle Whiskey in The Strip district of Pittsburgh. There, manager Anthony Levinson explained to us the Wigle origins - pronounced Vy-gle in the 18th century - and what happened in that rebellion. “Philip Weigle was essentially credited as being the first person to punch a tax collector, an incident that more or less initiated the Whiskey Rebellion,” Levinson told us. After that first blow, the people of southwest Pennsylvania, against whom this Whiskey tax hit hard, began protesting more violently, escalating to tarring and feathering tax collectors just trying to do their job. The situation became extreme when approximately four hundred protesters burned down the home of John Neville, a regional tax collector supervisor. America’s new president Washington recognized this as the first true test of the young country’s constitution. With Hamilton’s encouragement, the president began marching towards Pittsburgh with 13,000 troops, as many as were housed in Jockey Hollow before defeating the British. Washington’s show of force worked, and things settled down. The protestors basically dispersed, although Philip Weigel and a handful of others were arrested for treason, only to be later pardoned by the president. That was the Whiskey Rebellion, significant for being the first true test of this country’s constitution. The coda to this is the next president, famously anti-Federalist Thomas Jefferson, repealed the Whiskey Tax. 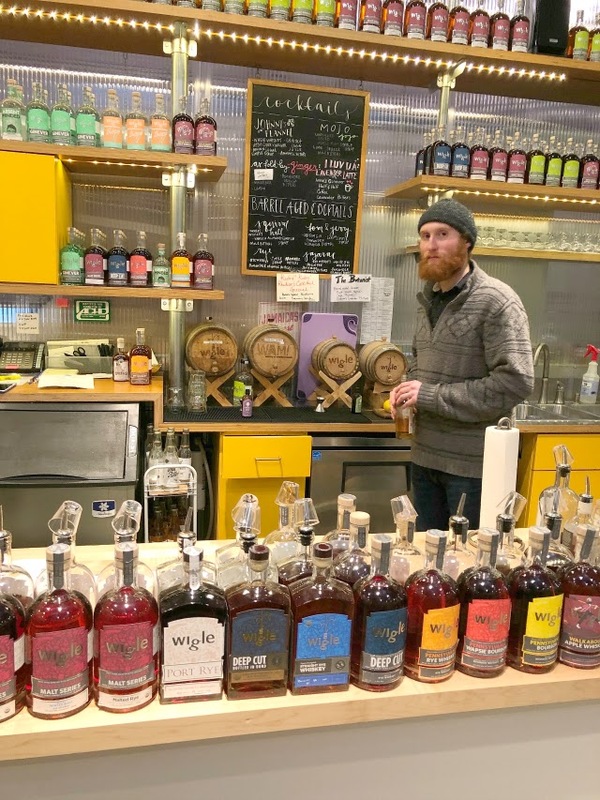 We really enjoyed sipping on the super smooth Wigle Whiskey and talking to Levinson. He reminded us that American whiskey is still an excellent domestic product, particularly here in Southwest Pennsylvania, and that taxes are still a problem.